On April 27 last year, the Supreme Court of Sri Lanka paved the way, for a formidable and sustainable national economy and an enhanced human rights image - two imperative needs to take Sri Lanka to the next higher level. Accessibility is an inherent right of everyone that can empower all people. It cannot be negotiated, bartered or diluted by anyone under any circumstances. It forms the foundation of freedom, justice, dignity and peace. But....., still, it’s being violated by most of the owners of new public buildings and heads of institutions. This apex court took into account the fundamental rights petition filed by this writer, who appeared in person on his wheelchair. The endeavours here were aimed to ensure safety, promote wider gainful opportunities, minimise unwanted dependency and arrest the waste of human potential through productive integration into society of everyone as equal partners, regardless of the degree of their abilities. The Court, under reference SCFR: 221 / 2009, has ordered several measures to be enforced in the design and construction of all parts of new public buildings and facilities so as to move towards establishing a society that values difference and respects the equality of all human beings, thereby enables everyone. Implementation of this court order will ensure the widest range of people - millions of whom have curtailed physical and sensory abilities - to unlock their potential and thereby live life to its fullest with dignity and with safety, supporting their communities. 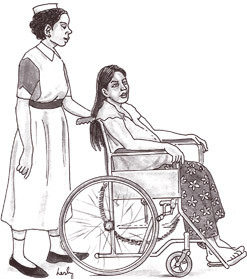 Accessibility and dis-Ability are not just about visible conditions such as people in wheelchairs or using crutches. They encompass the elderly, who will soon be a fifth of our population, pregnant mothers, those convalescing after surgery or illnesses and those with numerous debilitating conditions and ailments including impaired vision and hearing. Why should man continue to spend money, effort and time in constructing physical barriers? These safety hazards inhumanely hinder or prevent an estimated three to four million from taking a full part in social and economic life, thereby forcing them to live on the margins of society. Failure to provide safe access to facilities disregards established national standards in building construction (SLS/ISO/TR 9527:2006), violates orders given by the Supreme Court of Sri Lanka and ignores legislation for designing building parts (Accessibility Regulations gazetted on October 17, 2006) that received unanimous parliamentary approval on March 20, 2007. ATM machines of several leading banks, supermarkets of reputed companies and toilets and wash facilities of even four and five star hotels are the biggest problems here. They are often safety hazards for all people! We all are ‘able-bodied’ temporarily, and only to varying degrees. Every one of us is certain to spend some of our time living with curtailed ability to grip and hold, turn, move or see. When ability gets restricted, why should simple everyday activities become complicated or unsafe? The environments and facilities we build today must be a joy rather than a trial to use by these vast numbers tomorrow. Politicians, businessmen and decision makers should recognise that more than 25 percent of our population - i.e. five million - have their abilities restricted. In the larger interest of Sri Lanka, everyone of us has a moral duty, social responsibility and legal obligation to take effective measures to arrest these violations. Doing so will also facilitate productive re-integration into society of our ‘war heroes’ as well as ‘war victims’. Failure to implement this court order further aggravates social, economic and psychological issues, wastes the optimum use of technology and productive human potential and thereby the country’s economy. Emanating from the fruitful discussions this writer has had, the Human Rights Commission of Sri Lanka (HRCSL), under the leadership of former SC Justice Priyantha Perera, has already initiated action to monitor failures to comply with this court order. As recognised by the Supreme Court, violations are a serious punishable offence attracting punitive repercussions equally to building owners and co-owners, heads of institutions and ministries. HRCSL invites all persons to notify the Commission, in writing, of violations of this court order with respect to ‘new’ public buildings and facilities designed and constructed after April 27, 2011. ‘Constructing facilities that are accessible to all is costly and non-essential expense’, is a total misconception. Accessibility is not an Add-on. If the ‘right measures are incorporated at the design stage as an integral part of the development of the construction, the cost incurred will add less than 2 percent to the total cost of construction. By contrast, most businesses must still be losing vast amounts of revenue and customers due to dis-Abling environments causing exclusion of this diverse and growing customer base. To make buildings and facilities that the public needs to access ‘enabling for all’ is good business sense. However, ‘designing for inclusion’ requires a thorough practical understanding of the intricacies involved. There cannot be any margin for error as it is a highly responsible task of great national importance that demands time, money and effort. As such, it is highly advisable that the authorities undertaking ‘building work’ should seek expert guidance especially from those with proven competence and wide experience. Furthermore, every building and site is unique in its access and egress problems and solutions. So each site must be assessed separately. Not to do that is a costly blunder we often see made even by giants in businesses. All parts of new buildings must comply with standards and design specifications. It is not an act of charity, but acts of justice for humanity. Implementing the Supreme Court order SCFR 221 / 2009 is indispensable for a suba anagathayak to everyone and imperative to take our country to the next highest level. It should be the corporate social responsibility of the state - every ministry in particular, the private sector and every citizen. It is ‘NOW or NEVER’ necessity for Sri Lanka.